Moynihan singled out two reasons behind the recent surge in Bank of America’s stock. Every few months, the CEOs of large companies sit for media interviews or speak at industry conferences. It's a great way for investors to get an update about what's going on at a particular company. Bank of America's (NYSE:BAC) Chairman and CEO Brian Moynihan recently did this, speaking at the 2016 Goldman Sachs U.S. Financial Services Conference earlier this week. He covered a lot of ground, focusing on the bank's progress in his prepared remarks before wading into his thoughts on the broader picture for banks in a question-and-answer session moderated by Goldman Sachs analyst Richard Ramsden. One of the interesting points Moynihan made in response to a question from Ramsden concerned the recent performance of Bank of America's stock. Its shares have been on tear since the presidential election, rising by 30% since this time last month. They've outperformed virtually every other big bank stock over this period and are now trading at a 52-week high. In fact, the last time its shares traded above $22 a share was in the fourth quarter of 2008. Moynihan boiled this down to two reasons. At this time last year, interest rates were in virtually the exact same position as they are today. On the long end of the yield curve, 10-year Treasury bonds yielded 2.25%. Today they're at 2.39%. On the short end, the fed funds rate has climbed a mere 25 basis points, or 0.25% percentage points following the Federal Reserve's decision to boost rates at its final meeting of 2015. At first glance, this isn't good for Bank of America. More than any other bank, it has positioned its balance sheet to benefit from higher rates. According to its latest quarterly regulatory filing (see page 90), it will generate $5.3 billion in added net interest income over the next 12 months if short- and long-term rates climb by 100 basis points, or 1 percentage point. Moynihan's point was that, while interest rates haven't changed much, investors' expectations of the short-term trajectory for rates has. The incoming presidential administration's promise to lower taxes and boost infrastructure spending (i.e., fiscal stimulus) will almost certainly translate into higher inflation -- at least according to economic theory. And low inflation is the one thing that's kept the Federal Reserve from raising rates since it did so around this time last year. Moreover, while it's true that long-term rates haven't changed much if you compare this time last year to today, they've moved a lot in the intervening months. The yield on 10-year Treasury bonds at the end of September, when Bank of America last publicly updated its interest rate sensitivity analysis, was only 1.6%. 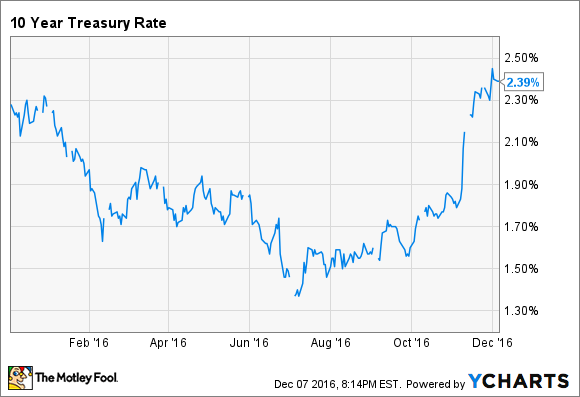 Long-term rates are now 80 basis points higher thanks to the outcome of the election. On this point alone, then, there are rational reasons for investors to have bid up Bank of America's stock over the past month. Another reason Bank of America's shares shot up after the election, explained Moynihan, is that President-elect Trump has promised to ease regulations in the bank industry. There are a variety of ways this could help Bank of America, but one of the main ones is that it may allow the North Carolina-based bank to distribute more capital to shareholders by way of dividends and stock buybacks. This follows from the fact that the Fed may soon lose its veto power over big bank capital plans, as has been intimated by members of Trump's team. The benefit to Bank of America would be twofold. First, it'd encourage income-seeking investors to buy its stock, as its quarterly distribution would increase. And second, it'd reduce the amount of capital on Bank of America's balance sheet, which would then juice the bank's profitability, which is measured by a bank's return on equity (if you reduce equity, and earn the same net income, return on equity rises). Thus, while this may not come as a surprise to many bank investors who have seen their portfolios soar over the past month, there are indeed tangible reasons for shareholders of Bank of America to be optimistic.